I dont know about you but as soon as payday hits I have to buy things straight away, I just cant help it! So when payday rolled around it was no different than any other time. I placed a huge Kylie Cosmetics order, I'm talking $200 worth of Kylie Makeup along with a $65 one too. So I'm mega excited for those to arrive, I mean you just gotta treat yourself every month! However while I'm waiting for those to arrive I thought I'd show you the other things I picked up recently. Starting with Feel Unique. I haven't placed an order with them in like two years but I kind of just stumbled onto the site and picked up a few bits. Starting with the Zoella Eyes makeup bag. Okay I realise I have enough makeup bags, infact I had 37 before Christmas and since then I've added at least another 5! I picked this up because I thought it was a decent size to have in my bag with me for work. Also there was like 15% off it at the time so that also helped. I also picked up the Zoella Lip Balm duo from her Christmas range. To be honest I bought these as I thought they'd be great to use in the background of photos. I have yet to actually use them and to be honest I probably never will but they do smell divine. I also picked up her solid perfume. I have wanted this for the longest time, again the tin I knew would look great in photos but I thought it'd be great for work. I get really scared carrying expensive bottles of perfume around with me incase I smash them so I think this will be absolutely ideal. It also smells divine, it's her original scent which is my absolute favourite. I finally picked up the Tanya Burr contour kit. Again this was one of those things I really wanted but just never got around to buying. The shades in it are extremely pretty but they are slightly chalky. The bronzer I find you have to be a bit careful with because it can come out very harsh. I also picked up a Fleur De Force eyeshadow palette because it was down to €1.99! I mean who wouldn't buy an eyeshadow for that price. I haven't tried it yet but I do love the purple tones to it. Finally I also picked up the Zoella Life is Sweet makeup/coin pouch because it is adorable. Again it was one of those things I never got around to buying. This was 100% bought and intended for photos. If you see me tweeting about buying anymore makeup bags though please tell me not too because it's getting a bit extreme at this stage! In Boots I picked up 3 of the new Garnier SkinActive mud masks. There are about 7 new ones of these but I only picked up 3 because I know it'll take me ages to get around to even trying them out. I also picked up a Boots Ingredients sheet mask in Hyaluronic which I since have used and must say I absolutely adored it! My skin felt like it was breathing after I removed the mask, it left my skin feeling so fresh and soft I absolutely loved it! I will definitely be stocking up on some more of these. I picked up the new Garnier Pure Clay Glow Scrub and I must say I'm in absolute love with this. Sometimes I want to do a little pamper for my skin but I just really couldn't be bothered with the mess of a mud mask. This is basically the exact same as their Clay Masks only it's a scrub so it exfoliates your skin while still giving the brightening effect! I was running out of my Nip and Fab under eye roller ball so decided to pick up the Botanics Radiant Youth to try out. It's skin toned and you can use it under your makeup which I like. It's real refreshing and I feel it just covers any dis-colouration under your eyes due to the flesh toned product. I picked up a Aussie Leave in Conditioner because it was down to €1.60 and I was in the market for a detangled spray so as soon as I saw this leave in conditioner reduced I had to pop it straight into my basket. This smells amazing and the scent lingers on your hair which I actually really like. Firstly I picked up the full size of their new Photo Finish Radiance Primer. I'm sure by now you've seen me talking about this whether it be here on Darling Jordan, Instagram, Twitter or Snapchat but I'm just obsessed with it! I also picked up a new Primer water because I cannot live without this stuff and currently have about 1/4 left in the bottle I'm using so I like to have a spare! Finally in a local pharmacy I found a Wet n Wild stand which I got really excited about. While it was quite empty I managed to pick up a Coverall Pressed Powder, two lipsticks and a lipgloss. Close up's will be coming soon in their very own post! I have tried Wet n Wild before and absolutely love it so I'm so excited that it's going to be easier to add to my collection now that theres a stand in town. That's everything I got this time around, of course I highly doubt it will be the last haul post. 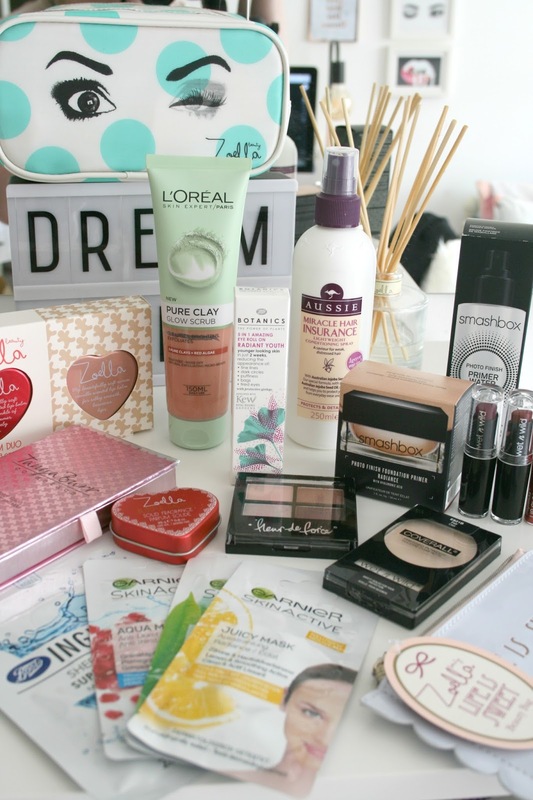 But c'mon who doesn't love a good 'oul haul post!? Did you treat yourself to anything when Payday arrived? I am SUPER jealous of this haul! I also really want one of those light up boxes they're so cute and look so good in blog post photography too. You lucky girl!